Once in a while you come across a storage system that cannot be managed through the GUI or you just want to script or use the CLI to perform management tasks on a VNX. Recently I came across an old VNX2 which GUI wasn’t responding the way I’d like, so I decided to use the CLI instead. In this particular case I needed to expand a LUN. Pay attention to the number and the prefix! It could be a lot of work if you needed to resize a LUN from 50GB to 60GB and instead GB, you used TB….. Sometimes CLI is so much easier than the GUI! When decommissioning a VNX, I recently forgot to remove the array from the existing domain. After the VNX was “unracked and unstacked” I saw my mistake and tried to remove it from the domain by using the “add/remove systems” in Unisphere, but the remove-button was grayed out. Even engineering mode didn’t help me. There is another way to remove unwanted VNXs from a domain! You might have guessed it already, because it’s by using the command line! First you’ll have to find out what existing VNX is the domain master. This can be done in Unisphere by looking up the current master. 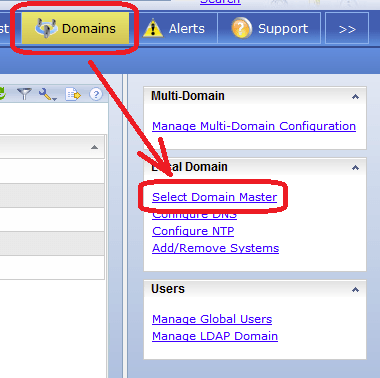 Click on “Domains” followed by “Select Domain Master”. The outcome will show you the list of domain in the domain as well as the current master. Over the years I collected a number of useful CLI commands to control the DMX / VMAX machines I worked with. Even though nowadays Unisphere for VMAX is a useful tool, nothing really beats the command line! The second command shows each initiator group nested within other initiator groups as well. The column under “Host Lun” shows the Host LUN ids. Sometimes you just want to run a VNX, Avamar, PowerPath, Data Domain or Isilon as a virtual machine to see how things work, or to write work instructions. And EMC offers a lot of these virtual appliances for free! Java, it’s a curse. And now you suddenly need to upload the spcollect files to EMC and Java isn’t installed or incompatible and Unisphere won’t start. Make sure you have NAVISECCLI installed and just do it from the CLI! I recently had the “pleasure” to figure out what was wrong with a Brocade based SAN environment. Servers were loosing connectivity on one of the HBAs, but all links were online and further investigation was necessary. Going through all the error counters on each of the long wave SFPs finally revealed one of the SFPs’ health as marginal (hence it was still online, but very buggy indeed). The webtools GUI showed this particular SFP als orange instead of green. Disabling and re-enabling this SFP didn’t help and I decided to shut this SFP for good. And guess what: all my troubles went away. The trunk this SFP was in went back to a non-redundant, but healthy state and all servers got back to normal operations and got their redundant paths back. So to summarize the story: look for marginal or even faulted SFPs when vague connectivity issues arise. If links are redundant, shutting the faulty one might help. Want to play around with VMware VVOLs? Here’s your chance! The Software Defined VNX is here! VMware now has this great new feature to be more in control of where its data blocks actually land on the storage system: VVOLs. But up until now EMC didn’t have a system capable of actually providing the back end for that. Until now I said. Starting with the VNXe 3200 all storage arrays are made vVOL capable and you can play around with that yourself. FOR FREE! The Software Defined VNX is now a reality!